Scroll below for my original and complete review on Pebble Epoxy Flooring. Having had this surface 8 years, I will get right to the point: I wish I had chosen something else like stamped concrete . The problem with the pebbles is that they are not easy to repair yourself. 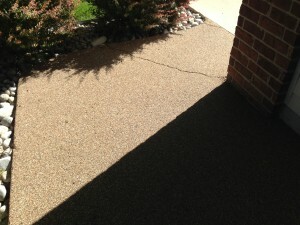 With regular cracked driveways you can use a product like DAP to patch, repair, and paint. If your flooring is experiencing any kind of settling whatsoever, the pebbles will break apart and it will not look pretty. The average user rating for this product is only 2 stars. We all seem to share the same regrets about pebble epoxy flooring. Everstone is basically a brand name of a surface known as Pebble Epoxy Flooring or Pebble Tile, an Epoxy-Mixed Resin of decorative stones which is used for surfacing patios, porches, driveways or any other type of floors in, or outside of a home or office. While I was in the market for having my cement driveway re-surfaced I came upon a pebble epoxy driveway while taking a walk. It looked good and it seemed durable. I looked it up and made a call to a local Everstone dealer and installer. He recommended against using this surface for a driveway as he said the turning of car tires would eventually wear grooves in the surface. He did say however, that pebble tile would be great for my porch and recommended the Elite Crete (reviewed here) for the driveway. I appreciated his honesty and ended up hiring him for both the Elite Crete driveway and the pebble epoxy porch by Everstone. Everstone is a very durable surface which is resistant to freezing, ice and extreme weather. It seemed perfect for my north-facing front porch which is extremely hard to keep dry and safe to walk-on during the winter months. Also, you can use salt and magnesium chloride on the pebble surface without worrying about damaging it. Because the epoxy-resin mixture of pebbles is approximately 3/4″ thick, it is elastic and unlikely to develop cracks and other structural problems. 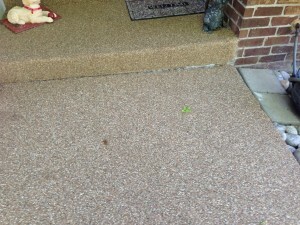 It is also cheaper than flagstone , tile and other decorative flooring. 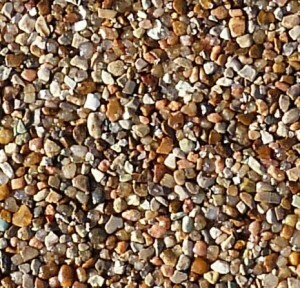 Everstone comes in a variety of pebble colors. The one I chose (pictured left) best matched the brick on my home. 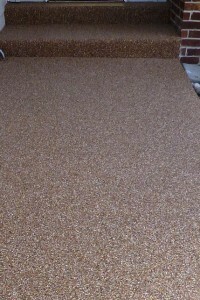 Everstone also makes an attractive, slip-resistant deck for swimming pools and backyard patios. The pebbles are offered in a variety of colors, so you can really spiff up a dull, drab beige or cement colored patio or pool deck, using the Everstone Product. Looks great, right? Well before you decide on an Epoxy surface, you might want to read a little bit more. As you can see by the photo to the left, the pebble tile surface was quite smooth, even and shiny immediately after installation. It definitely added a unique, classy look to the front of our home. Pebble tile flooring requires a stain treatment every couple of years or so to keep the surface looking brilliant and shiny. Most of us would have no problem doing this type of work ourselves and my Everstone installer even offered to train me on what stain to use and how to do it. This seems like a reasonable maintenance expense to keep the front porch looking nice so I was completely onboard with the idea of having to do this. However, before proceeding with this installation there were a couple of other issues I wish I had considered. The Now photos below will describe this better than I can in words. My Everstone Pebble Epoxy Flooring installer insists that this type of surface is more forgiving when it comes to cracks and settling of the foundation underneath than traditional surfaces such as concrete . These pictures might suggest otherwise. My pebble stone surface has split and cracked. Unlike a concrete driveway, the cosmetic appearance looks extremely conspicuous and this is not something I could easily fix with my own Concrete Crack Repair product. The first photo above, left is how my front porch looked just days after it was installed. As you can see everything is just great. The photos to the right, below, 4 years later, show just how unsightly pebble epoxy flooring after four years of surface movement. The diagonal crack in the first picture continues to widen over time. Isn’t it scary just how quickly your surface can move. There were not any cracks nearly this big when I had cement there. The second picture shows how deep the movement is as you can see how the surface has sunk a good two inches from the first step. Obviously, not all surface areas are prone to the same amount of movement as my front porch. It is very likely that some Home Warranty will have no problems with this at all. However, as you can see by the photos, comments and responses to this article, epoxy flooring can be a gamble. In fairness to my Everstone installer, he has done everything that was asked of him and said that this surface can be repaired. Either I will have to pay him to repair it for me, or I will be looking up some good articles on how to repair Pebble Epoxy Flooring.